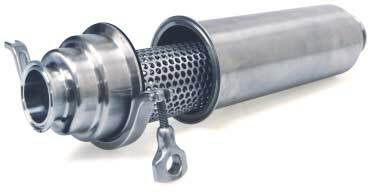 Top-Flo in-line stainless steel filters and strainers are specifically designed for the removal of unwanted particles from process line content providing added protection and longer service life for pumps, valves, heat exchangers and other processing equipment. Constructed of corrosion-fighting 316L stainless steel, Top-Flo in-line filters and strainers feature a sanitary design plus ease of installation and quick cleanup. These rugged, yet lightweight strainers are available in two lengths and are interchangeable with other comparable strainers. The Top-Flo stainless steel strainer is ideally suited to hygienic process applications including dairy, food, beverage, pharmaceutical and biotech.